It is the last night of the 2012 Olympics, and as the closing ceremonies start I find myself already nostalgic. This past two weeks has renewed my faith in the human spirit, inspired me to want to improve myself, and best of all, has provided a chance for me to bond with my three-year old, Mirabelle. Mirabelle recently received a new little sister as a (mostly) welcome gift. But with her father away a lot on business, she has felt the challenge of having to share my affections. Enter: pre-bedtime nighttime ritual. Every day and night for two weeks we have reconnected over these games. She loved you from the moment she saw your bright smile. Once she learned your name she repeated it constantly. She couldn't get enough gymnastics (and not just because of the sparkly leotards, although initially that was a big part of the appeal). As an aside, she also enjoyed watching diving, running, swimming, even rhythmic gymnastics--though to my shock she grew tired of that quite quickly. But whenever you and the Fabulous Five came on, she was utterly transfixed. We went to the library and checked out books on gymnastics, which she carries with her everywhere. She tries handstands against the wall. She practices her forward roll again and again. She falls off the balance beam, but then gets right back on, "Just like Gabby". This is one the best lessons you gave her from the Olympics. Not only did you display your athletic prowess, but you actually looked you were having FUN out there! And when you fell off, you got back on, and finished the job, with humility, grace, and still smiling. This is something I hope Mirabelle takes with her throughout life. I don't know if the gymnastics obsession will last, but it doesn't matter. I have cheered for her countless times, placed a cookie monster necklace around her neck as a medal, seen Baby Sister giggle at the drama of it all. I have been reminded that my daughter is a graceful, athletic, smart, thoughtful and joyous girl. 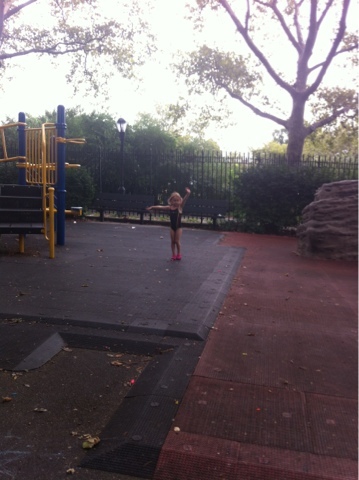 I have watched her swinging in her leotard at the playground, "So high I can touch the sky!" Head back, eyes closed, feeling the breeze, feeling like she can do anything. Because she can.